As much of a beauty Summer may be, living in a part of the world where the temperature rises above 41 degrees Celsius may need a survival strategy. It is even more necessary if you are left with no choice but to travel in the scorching sun regularly for an hour. 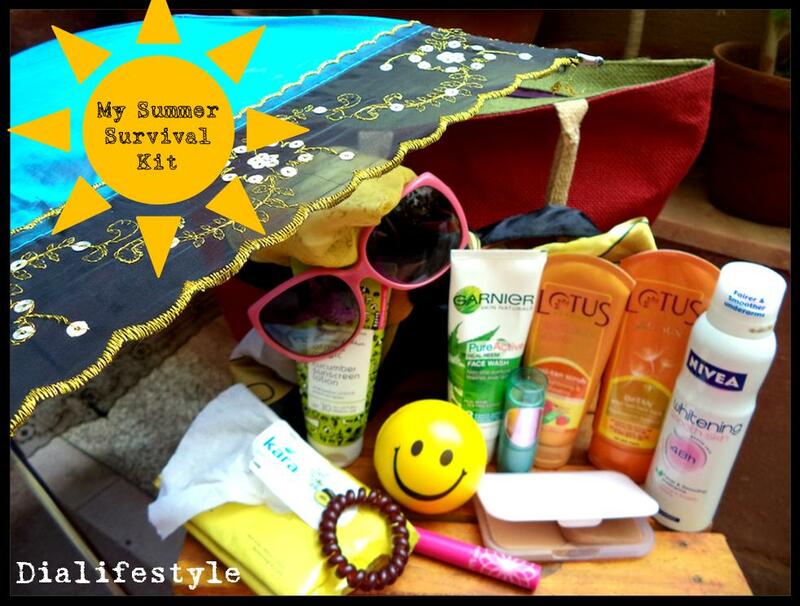 So here is a summer survival kit for my skin and hair. 1. Umbrella: It is a bare necessity when it comes to stepping out in the sun. Carrying an umbrella shields you from 40% of the harsh UV rays. 2. Scarf: If you spot me outside in the sun, chances are rare that I will be recognizable. Half of my face and my entire head is wrapped in a scarf. Call it a desperate attempt to avoid sunburn, but it also works great in protecting myself from dust and pollution. 3. Sunglasses: Well, I do not think there is anything to be said about these. Even if you do not care about your eyes getting damaged by the sun, these still call for a major fashion statement. 4. Anti-tan scrub: All that attempted protection from the sun works fine but some (pretty major in my case) amount of sun-burn is inevitable. This scrub is an immediate refuge after a day out in the sun. Sadly, my anti-tanning regime is always at night. 6. Deodorant: Used for obvious reasons. But although this product claims to whiten your skin, I do not see much of a difference. I like the way it smells and thus it goes in my regular usage list. 7. Face Wash: I would recommend carrying this with you all times. Thanks to all the sweating, our skin tends to attract more oil and dirt thus inviting big bad acne. But a face wash is best used twice (thrice if necessary) a day. 8. 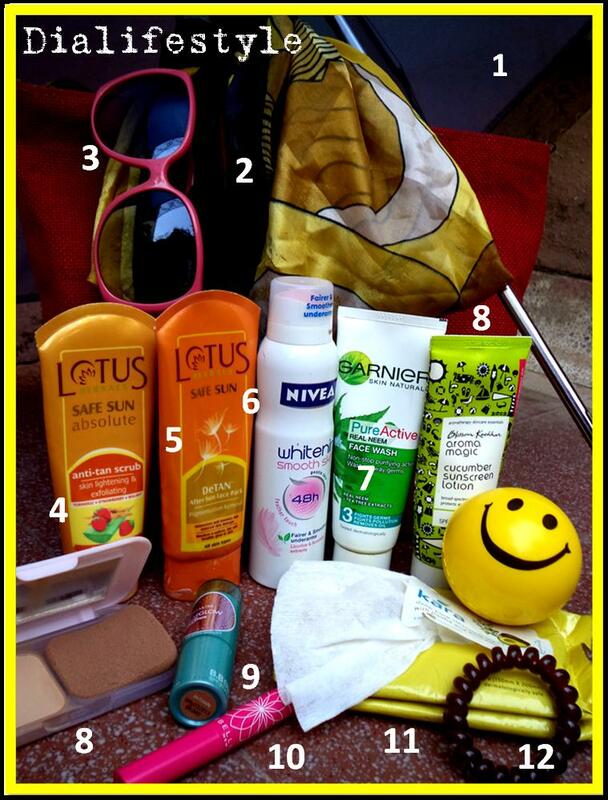 Sunscreen: This is a MUST! It is best applied 15 minutes before stepping out in the sun as it takes that long to get absorbed in your skin. 10. Lip Balm: Your lips need protection too you see. 11. Cleansing Wipes: A great help when you get sweaty and washing your face is not an option. 12. Head band: It is always a good option to keep your tresses locked away. This is what my summer survival looks like. There are other stuff of course, like chilled beverages, watermelons, light cotton clothing, early morning swims. But most importantly, summer is all about having a blast of a time. Do share your summer stories with me and do not forget to keep up the heat!